We really should care about Africa… these are communist despots we are talking about and they are redistributionist and murderous. Apartheid may have ended, but now South Africa is swinging the other way big time. White farmers are furious and the government has announced the seizure of 139 farms to redistribute to black farmers in a supreme incidence of racist social justice. These farmers did not hurt or kill anyone. They aren’t engaged in racism either, yet they are having what they have worked their whole lives for ripped from them and given to someone else based solely on skin color. 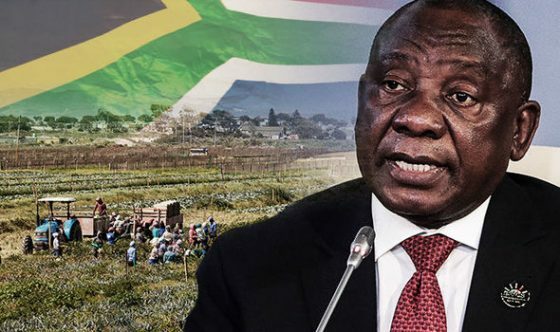 South African President Cyril Ramaphosa announced last week plans to allow white people’s land to be taken without compensation, which will then be distributed to black people in a move that he believes will be good for the economy. That won’t end well for South Africa’s ruling African National Congress (ANC) and it will definitely egg on class warfare and violence. There have already been numerous incidents that I’ve heard of concerning the murdering of white people in South Africa simply because they are white. The president made the announcement late on Tuesday in a televised address to the nation. The media cited Zizi Kodwa, a member of the ANC’s national executive committee (NEC), as saying that the move should be “appreciated” by domestic and international investors, given that “long-term investment is tied [to] ownership of land by the majority of people.” “In other words, if you are talking about sustainable long-term certainty, it is tied to addressing the injustices of the past. You can appreciate the jittery response and so on, the shocks at the moment, but what we are doing now is to create policy certainty and the conditions for future investment,” Kodwa added. The farmers have claimed that the government’s plan will be “catastrophic and could lead to anarchy and food shortages like Venezuela or Zimbabwe.” Oh, it will do that and so much more. It’s a certainty. Zimbabwe’s economy collapsed after they did something similar. Ramaphosa claims that 20 years after apartheid ended there, nine percent of the population is white and owns 79 percent of the farmland. These families have worked that land for decades and it’s theirs. It is theft to take their land and give it to others like this simply because they are white. This is the same kind of logic some use here in the United States when it comes to historic slavery in this country. Take what white Americans have now and give it to those who haven’t earned it simply because they are black. That is the very definition of racism. Americans today did not commit those atrocities and can’t be held liable for them. The people that want to take what others have earned are not entitled to ill-gotten gains this way and are Marxists in every sense of the word. In the 1990s black South Africans received grants and subsidies to buy land plots, which resulted in overcrowding and poor land use. Most of South Africa’s black people live in crowded urban areas or rural reserves. The 1913 Native Lands Act made it illegal for Africans to acquire land beyond these reserves, which became known as “Homelands.” About one-tenth of land in white ownership has been transferred to black ownership since the end of apartheid, which is only a third of the government’s target. A tweet on the ANC’s parliamentary Twitter account further shocked many on Thursday when it appeared to call all white people murderers. The party has subsequently deleted the tweet and said it was quoting someone else, though lawyers say they can still be held accountable. It read: “The biggest mistake we are making is to consult murderers. White people are 9% of the population, they own 79% of [the] land. They never came and consulted us for the land. If they want us to forgive them now, then let us share the land, the mineral resources.” Sounds like racial communism to me. The party then told its critics who were incensed by the tweet that it had merely been quoting the remarks of one of the members of the public who had come to the parliament’s constitutional review committee’s public hearing on the review of section 25 of the constitution that was being held in the town of Beaufort West in the Western Cape. Very few believe that excuse. A legal expert, Helene Eloff, also weighed in to make it clear that the ANC had blundered and could be held liable for the view expressed since a disclaimer can’t be applied retrospectively. And it all ties back into seizing the farmland from white farmers and the hatred of anyone who is white. The ANC in the Western Cape on Saturday congratulated the joint constitutional review committee for successfully conducting public hearings into whether the constitution should be amended to allow for expropriation of land without compensation. The committee had held public meetings across the Western Cape in the past week, and on Saturday finished the public consultation process with a public meeting in Goodwood in Cape Town. In a statement, the party said: “The people of the Western Cape have spoken. From Oudtshoorn to Beaufort West, Citrusdal to Swellendam, and finally, the Cape Metro, our people have unequivocally and overwhelmingly said section 25 of the constitution must be amended in order to fulfill the broad and fair land ownership across the province. “The ANC is proud of its members who came out in numbers and made solid contributions in the public hearings. Our members and supporters are saying land reform through the amendment of section 25 will open the province’s productive forces and, contrary to popular belief, will actually increase agricultural productivity and be the catalyst for the broad industrialization of our country as millions get absorbed into [the] mainstream economy. 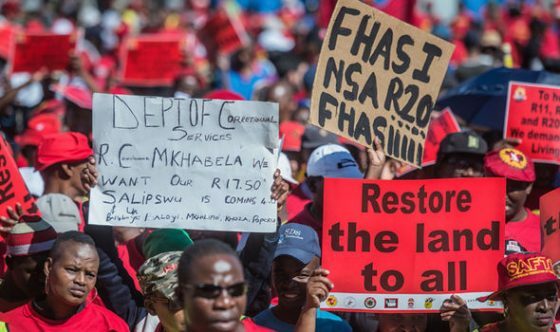 Parliament’s joint constitutional review committee on Saturday concluded the provincial public hearings into section 25 of the Constitution in the Cape Metropolitan Area with one of the biggest gatherings to date. The committee, which held a total 34 hearings in all nine provinces of South Africa, was instructed by the National Assembly and the National Council of Provinces to ascertain whether a review of this section and other clauses were necessary, to make it possible for the state to expropriate land in the public interest without compensation. It was also asked to propose the necessary constitutional amendments where necessary. Racist bigoted scum you are. Hundreds of concerned citizens attended the hearings Saturday at the Friend of God Church in Goodwood. The church held 1,500 and there were many more people outside that could not get in. Co-chairperson of the committee Vincent Smith said that following the hearings, the committee would assess the hundreds of thousands of written submissions it received after which it will invite those submitters, who indicated that they wanted to make oral presentations, to hearings at parliament. Once the process is finished, the matter will be deliberated before they report to both houses of Parliament. The ruling ANC this week announced that it was going ahead with its intention to review the contentious section. In a late address on Tuesday, ANC leader and President Cyril Ramaphosa said his party will, through the “parliamentary process, finalize a proposed amendment to the Constitution that outlines more clearly the conditions under which expropriation of land without compensation can be affected.” It’s basically a done deal and there is still a very real possibility that white farmers and others will be slaughtered as this hatred moves forward. The ANC is communistic in nature and the hatred runs deep here. It can’t possibly end well. Even if it was genuinely someone else’s tweet which was not the way it tweeted at all! Why on earth would the ANC be so blatantly irresponsible by sharing such racially divisive hatred on a public domain in their @ANCParliament name? Tweeting 101: if it's not a retweet, or in quotes, or directly attributed to a third party, it's YOUR tweet. ALso, the disclaimer cannot be valid retroactively. If the ANC did not agree with it, they should have stated accordingly from the get go. Unacceptable. You can't backtrack now and pretend you didn't didn't say it. According to SA law if you tweet it you said it. Too late buddy. So would you also uncritically tweet someone calling black people the "k" word without quotation signs or attribution? This was either a really bad slip-up, or you are revealing more of your biases than you intended. Deeply worrying either way. You tweeted racial hatred. Own your actions. Tsk! What about a modern deliverance , from an impending genocide , upon The Poor Whites , in the south african poverty camps , whom are not allowed , or whom cannot evacuate – ( for whatever reason ) ? If you know real history , then you understand , it is they – ( The White Destitute ) , who are The Real Boers . On the other hand , the metro elite & propertied farmers – are the jew / dutch / english / afrikaners , that have assumed the identity from , and have always oppressed , The True Germanic Boers . Yes Sir , there is a way out for them – ( The Despised Poor ) , but it’s not the “ rapture “ . —- Self Defense is an obligation to GOD , ( 1 Timothy 5 : 8 ) , THB , kjv . Beware of imposters & deceivers & secret enemies ( Revelation 3 : 8 – 12 ) . The leading adversaries against THE LORD JESUS CHRIST , know “ much “ about The Great Escape . Their blood vendetta & hatred , prompt them to the “ dark arts “ , and the exhaustive “ expert “ study , of the stolen Sacred Scripture – THE HOLY BIBLE , ( even though it pertains to them – only for their condemnation ) . They are blinded to think , that they can anticipate and thwart , The Archangel Michael ( Daniel 12 : 1 ) and “ The Holy Companions “ – ( Angels , Captains , Disciples ) . Little do they really understand . They are only stumps & rocks in the field , of GOD’S great world drama , wherein He works to save ( plant and husband and harvest ) the souls of men and women , one at a time . The wheat / flour mill of THE LORD , grinds slowly but grinds very fine . No one yet knows , what we shall be made to become , but we trust it will be wonderful . Everyone will receive their fair chance , and just opportunity , even though it may not seem so , at the moment . For The Righteous – during the 1000 year millennium ; all wounds will be healed , and all injustices will be made right , and all babies that were aborted – will have an upbringing by loving parents . Come out of wickedness . Separate from uncleanliness . Look forward to The Marvelous Work and Wonder , of GOD’S Deliverance , and the impending presence of JESUS – THE GOOD SHEPHERD , coming at the end of the tribulation , and then is the beginning , of the new era .